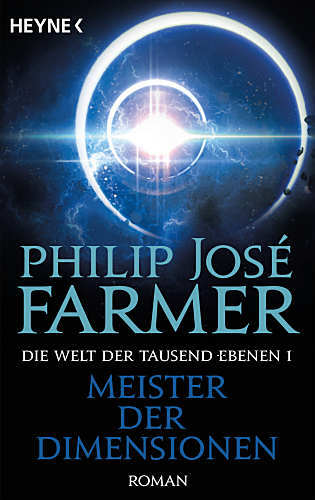 German excerpts, as "Meister der Dimensionen", have been published in the anthology Im Bannkreis der Magier (1982). Robert Wolff's discovery of a strange horn in an empty house catapulted him into the most incredible adventure of all time. For that horn could open up a door through space-time to a cosmos with dimensions and laws totally different from our own. 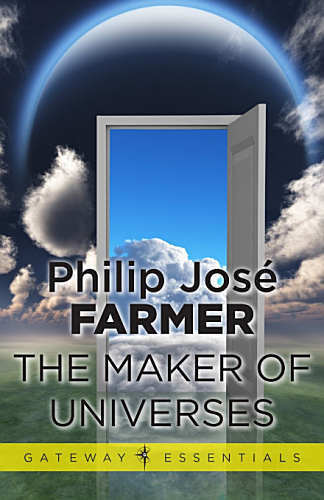 The universe he entered was a place of tiers - world upon world piled on each other - and each level was different and more fantastic than the next. In order to return to his home, Wolff would have to ascend each tier and contend with weird creatures - like Kickaha the Trickster, and Podarge the venomous eagle-woman - until he found his way to the topmost tier ... and the god, or the madman, that ruled the universe. 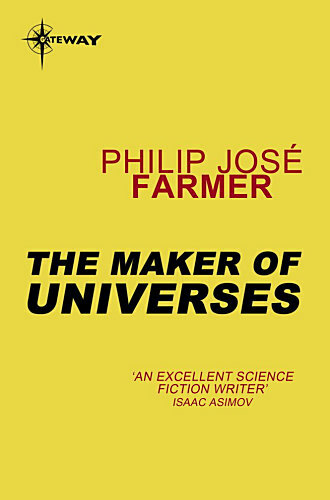 THE MAKER OF UNIVERSES is the first of Philip José Farmer's amazing and original World of Tiers Books - some of the most thrilling and colorful science fiction adventures ever created. With interior illustrations by Jack Gaughan. First hardcover. Black cloath boards with silver lettering on the spine. A photographic reprint - including the copyright page - of the 1970 Sphere edition. No indication in the book that this is the second edition. Revised text. Trade edition of one thousand copies. Dark brown leatherette with gilt lettering on the spine and the letters 'PJF' blindstamped on the front board. With an Author's Foreword. Revised text. Deluxe edition of two hundred copies, signed and numbered by Farmer. Dark brown leatherette with gilt lettering on the spine and 'PJF' in gilt on the front board. In a slipcase, also with dark brown leatherette. With an Author's Foreword. The fifth printing is included in the Ace (1981) boxed set of The World of Tiers books. According to the book this is the fifth printing, it's however the sixth. Including stories by Fremont Dodge and R.A. Lafferty. Excerpts of this novel have been published in the anthology Im Bannkreis der Magier (1982). Included are also an editorial, fandom news, a profile of Brian W. Aldiss, letters from readers and articles. Including fifteen pages with an Italian bibliography of Farmer, compiled by Ernesto Vegetti. Pictorial boards. Omnibus, together with The Gates of Creation. Both novels have been switched in the book. First comes the second novel in the series, and then this one, the first. Omnibus, together with The Gates of Creation, plus a story by Theodore Sturgeon. Exact the same book (and the same data) as the 'Fantasy Book Club' edition, see next entry. It only has a different dustjacket. Omnibus, together with The Gates of Creation, plus a story by Theodore Sturgeon. Book 4 in the 'Fantasy Book Club' series. The series name, Клуб любителей фантастики, blind stamped on the front board. Pictorial boards. Illustrated by S. Atroshenko. Omnibus, together with The Gates of Creation. Pictorial boards. Omnibus, together with The Gates of Creation. With interior art by N.V. Lyubeshkin. Omnibus, together with The Gates of Creation. Illustrated by S. Korshunova. Pictorial boards. Omnibus, with the first four novels of the series. Illustrated by A. Derzhavin. Pictorial boards. Omnibus, together with The Gates of Creation. Pictorial boards. Omnibus with the first four novels of the series. Omnibus, together with The Gates of Creation. Pictorial boards. Omnibus, together with The Gates of Creation. With interior illustrations by A.M. Hainzon. Pictorial boards. Omnibus, together with The Gates of Creation. Illustraed by I.G. Omelchenko.